"Sampath Speaking" - the thoughts of an Insurer from Thiruvallikkeni: SS Mantola sunk in 1917 with huge silver cargo explored now ! SS Mantola sunk in 1917 with huge silver cargo explored now ! Strange things happen at Sea. The Ocean is very deep. There is always the Q of “Who owns the Sea” and further addendum of who owns those objects that are in the sea bed deep in the Ocean ? There is news of a Florida treasure-hunting firm discovering the remains of a British passenger steamer 94 years after it was sunk… this comes in the wake of discovery of the remains of the British freighter SS Gairsoppa, sunk by a Nazi submarine in 1941 with 200 tons of silver aboard. The silver inside that vessel would be £155 million ($241 million) (Rs.1188 crores) at current prices. Riding on the crust of success, the US marine exploration company Odyssey Marine Exploration confirmed that on 10th Oct 2011, it had located the SS Mantola, a British ship which sank on February 9th, 1917, after it was torpedoed by a German submarine. The company did not give the position of the wreck, but it is known to have sunk 143 miles west-southwest of the Fastnet Rock within the 200-mile Irish exclusive economic zone. A Sailing Ship is a beautiful sight.. “Ships are safe at harbour but that is not what they are built to be” is an oft repeated saying. Each ship make hundreds of voyages criss-crossing the Ocean but they are wrought with innate danger of fortuitous accidents or casualties peculiar to transportation over navigable waters - a collective term known as ‘perils of the sea’. Perils of sea are fortuitous encompassing unusual violence of waves or winds, collision of ships, striking a submerged objects, sinking and more…… Ships are constructed scientifically to float on water but few things could turn it over into a nightmare causing sinking – causes could range from simplest of leaks, navigation errors to human action. What happens to the massive vessel once it sinks is a mystery ! Untrue to the common notion, it may not rest in the sea bed in the same place in the same condition as it went down. There could be host of factors that could determine the positioning and preservation of the wreck which would include : the construction materials, the wreck getting covered in sand or silt, salinity of that place, the extent of damage suffered, presence of marine animals, the acidity / chemical traits, of the cargo that it was carrying……. – there is something known as stratification i.e., silt, sand sedimentation piling up on the wrecks; there would also be barnacles attaching themselves permanently to a hard substrate. The wooden components would decay faster. There could be worms which bore into wooden structures and destroy the hull..
British India Steam Navigation Company was a famous British steamer line that operated from 1856 till 1972, when it was absorbed by P&O. 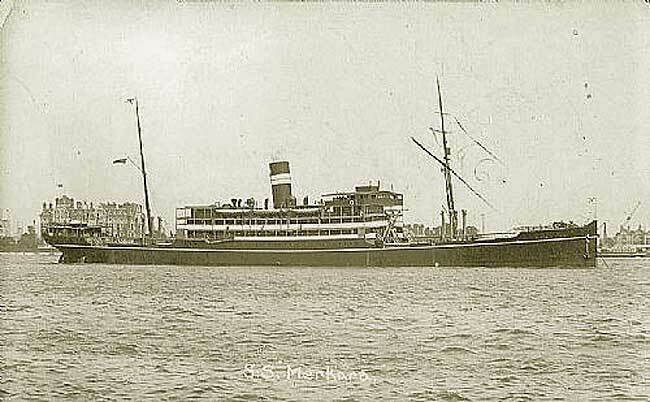 one of its many vessels was SS Mantola, a passenger steamer. Launched in 1916 by Barclay Curle & Company, Glasgow, she sailed for less than a year before being sunk by a German U-boat and she reportedly was carrying a large quantity of silver bullion. 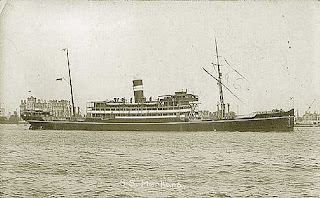 The newly built ship was on her way to India, under the command of Capt D.J. Chivas when she was torpedoed by uboat U-81 (Raimund Weisbach), 143 miles WSW of Fastnet. Despite all attempts to save the vessel she started sinking at the head. All were safely got into boats, save seven Indian crew who drowned. Survivors were landed at Bantry the following day. The Naval Service said it notified the company’s research ship Odyssey Explorer that it should inform the Irish authorities when it came across the vessel surveying some 25 miles west of the Blasket Islands, Co Kerry, on August 2nd. Under international law, a ship undertaking scientific research should inform the relevant state. However, Odyssey has said that searching for wrecks is exempt from this. Wrecks of less than 100 years old are not protected by Ireland’s National Monuments Act. Now the same amount of silver would be worth $18 million. (88 Crores of Indian money !). There are also reports that the incremental costs to search for the Mantola were low, as this was a contingency project in the event that the explorers successfully completed the SS Gairsoppa search early. Shipwreck law determines important legal questions regarding wrecks, perhaps the most important question being the question of ownership. Legally wrecks are divided into wreccum maris (material washed ashore after a shipwreck) and adventurae maris (material still at sea; although some legal systems treat the two categories differently, others treat them the same. Wrecks are often considered separately from their cargo. In an old English case, it was accepted that the remains of the vessel itself were owned by the insurance underwriters who had paid out on the vessel as a total loss by virtue of the law of subrogation (who subsequently sold their rights), but that the property aboard the wreck still belonged to its original owners (or their descendants).